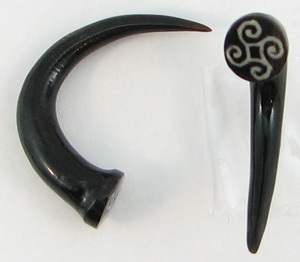 These large gauge horn tapered claws have bone dust 4-sprial inlaid nail heads. They are unique, eye catching, light weight and comfortable. These water buffalo horn earrings were handmade from natural materials, so some variation (such as color, texture, size, etc.) is present from piece to piece in a pair and also from the pair shown in this photo. 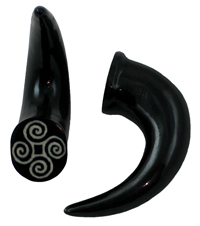 Approximate Dimensions: 1.06" tall for the smaller gauge sizes and up to 1.95" tall for the larger sizes over 1/2 inch. Available in sizes 3 gauge up to 5/8 inch diameter. 0 gauge (+$2.00) Select your size and click "Add to Cart".